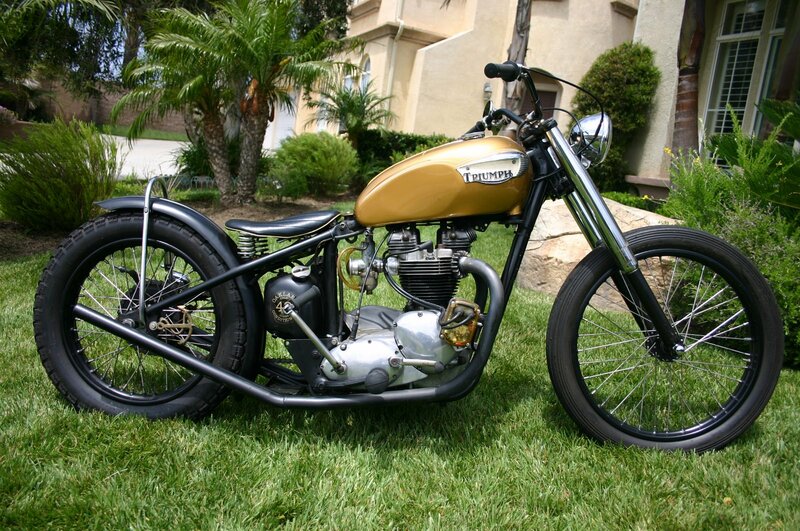 Four Aces in California specialize in Triumphs and other British bikes. 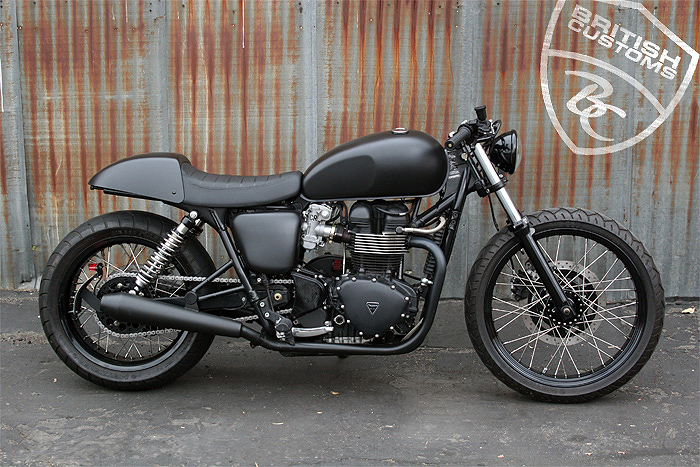 Below is an example of one of the Triumph customs they built recently. 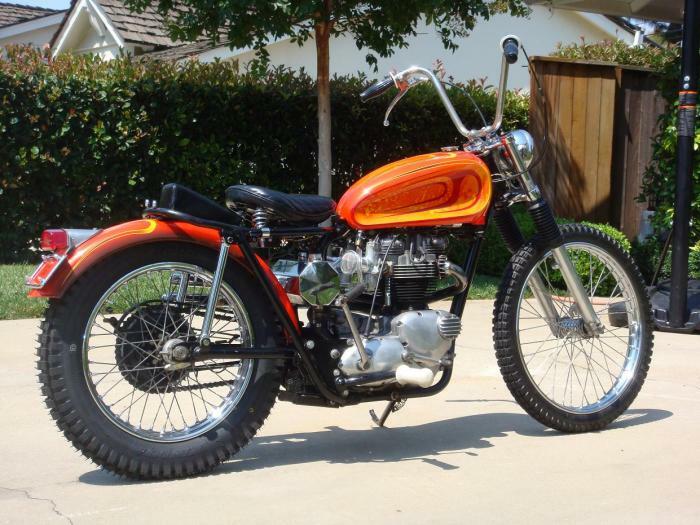 This is how Four Aces describe this awesome bike… “Long time friend and customer Luis bought a crusty old pre-unit at a now defunct local swap meet and brought it in for some minor fixing up, but the more we dug into the bike, the more we discovered stuff that needed to be fixed or massaged. The bike had been a funky desert sled with some period chopper parts added later, but it became a neo-hot rod So. 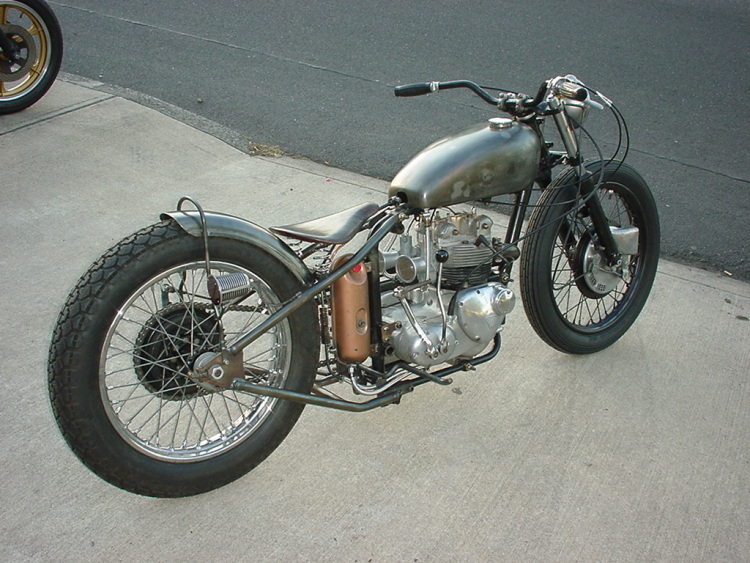 Cal styled cruiser. We worship at the alter of the ribbed fender and peanut tank around here and Luis’ bike screamed for this treatment. The muted color design and blacked out front end and wheels were at Luis’ direction. The result of the minimal chrome is a stunning understatement. 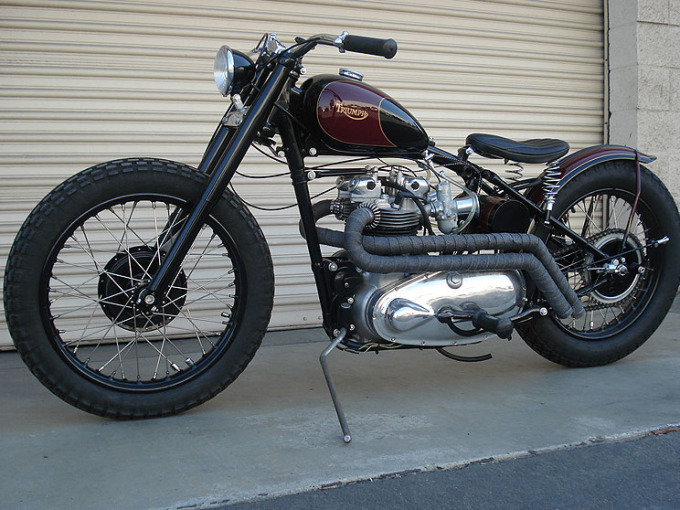 Rick Grindle’s paint job is the coolest mix of stock 1948 Speed Twin and 1950’s bobber that you will ever see. Wrap the custom made exhaust pipes with hot rod heat wrap and it is something old, and something new. We love our So. Cal Style”. 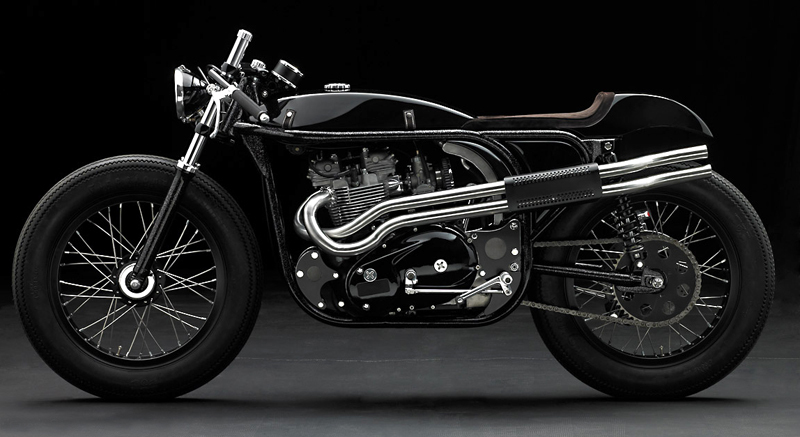 For more from the talented guys at Four Aces check out some of their latest bikes. 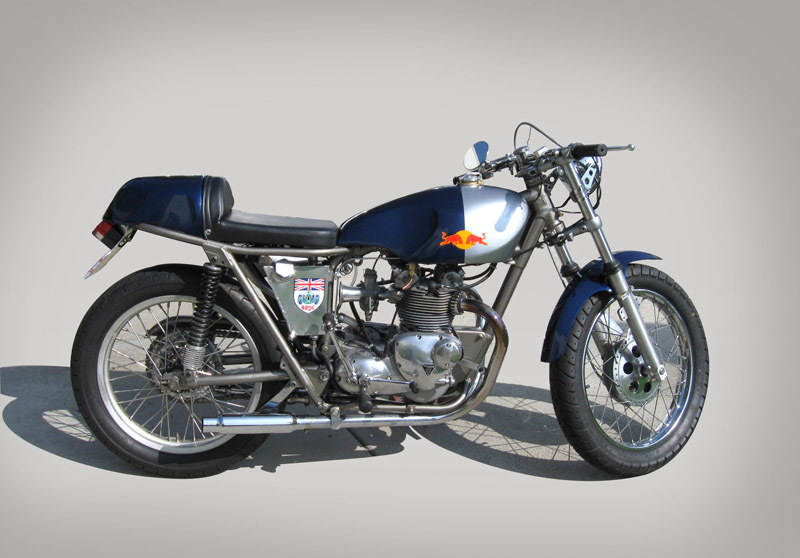 British Customs in California have parts and accessories for nearly every model of Triumph motorcycle. 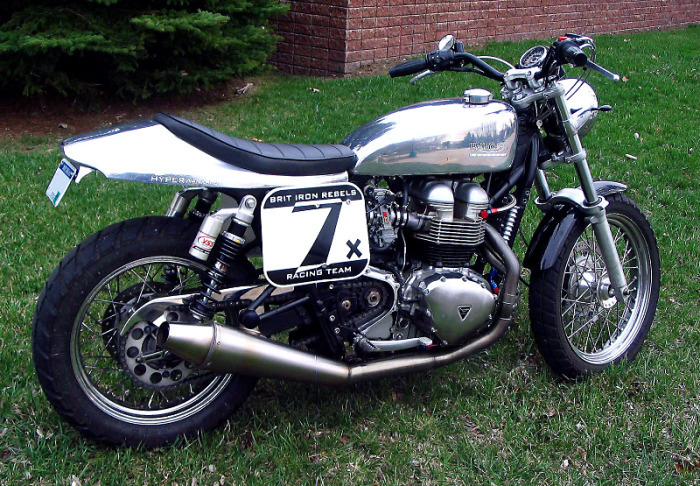 They sell some great Triumph body accessories like cafe racer seats, fuel tank covers and custom pipes. 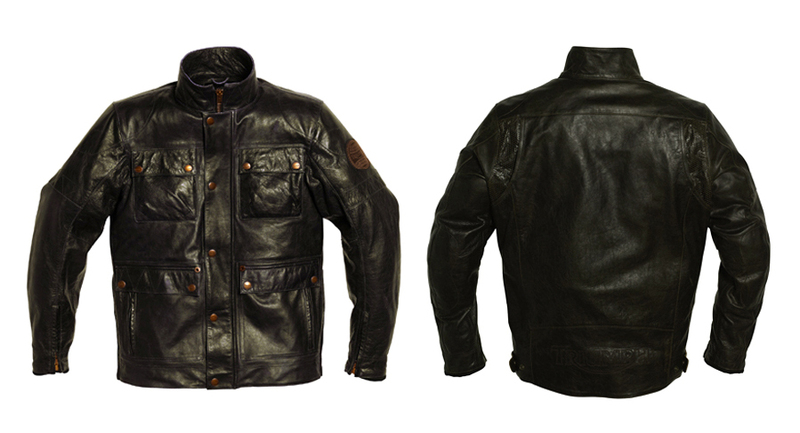 The black Bonneville below was customised from all their gear. Love the black on black. It looks a little bit cookie cutter at the moment but once you add your own personal touches it could be a really sweet ride. (Would like to see a big dent in that tank as well, looks too new and perfect). 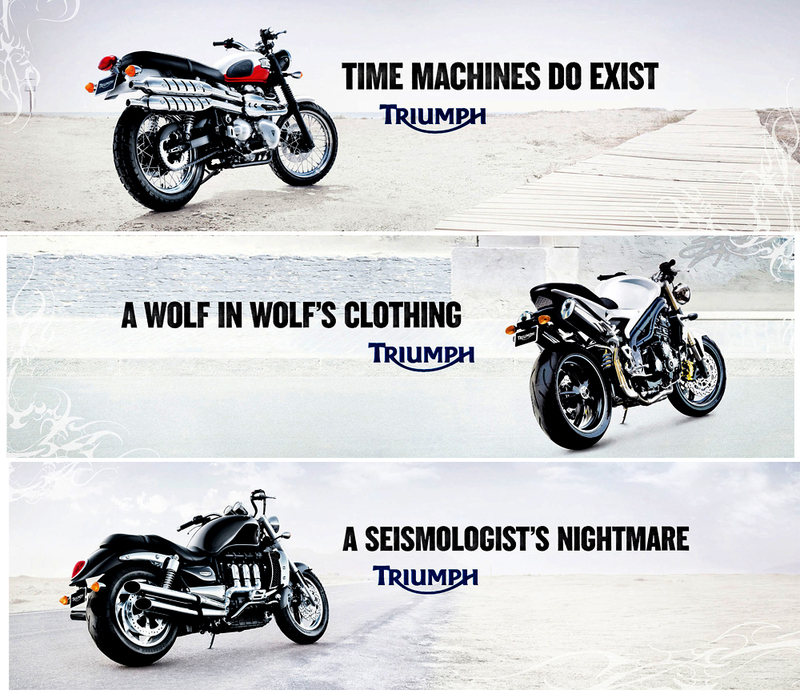 These Triumph Motorcycle billboards were found on Ads of the World. The ads don’t blow us away but they are better than a punch in the head (actually it depends if the ‘punch’ is alcoholic). If you don’t know what a Seismologist is then you should go back to school, or google it like we did. As it turns out it didn’t make the ads any better. We still love the scrambler and kudos to Triumph for manufacturing it again.